HORNDEAN came from behind to beat Western League side Melksham 2-1 in the FA Cup extra preliminary round at Five Heads Park. Home manager Michael Birmingham was relieved to see his Wessex League premier division side earn some much needed cup cash. They collected £1,500 for progressing through. ‘The first 45 minutes was the worst I have ever seen,’ said Birmingham. ‘It was that bad I was wondering if there was anything better I could do on a Saturday afternoon. ‘Melksham just hit the ball long to their two target men and we got dragged down to their level. ‘It was a case of who could hit the ball hardest and furthest. ‘The best thing to happen to us was going a goal down in the second half. ‘Suddenly we injected a bit of pace and urgency in our game. Two goals in the final 10 minutes turned the tie around with Conor Duffin involved in both. First Duffin got on the end of a Jack Maloney cross to fire in from six yards and two minutes from time he set up Mark Smith for the winning goal. A second half hat-trick from Bobby Scott helped AFC Portchester cruise to a 5-1 win at Christchurch. After a goalless first half Steve Ramsey and Dale Mason also found the net for the Wessex premier side to see off their division one hosts. ‘I always felt once we got the first goal we would go on and win quite easily,’ said Royals assistant boss Ian Saunders. Fareham Town recovered from a poor start to beat Bashley 4-2 in the New Forest. The Reds will travel to face Southern League Salisbury in the next round. The visitors fell behind after only four minutes but hit back almost straight away with a Lee McCombie equaliser. A deflected Simon Woods shot restored the Reds lead only for Bashley to level early in the second half. Late goals from Curtis Robbins and Callum Laycock confirmed the Reds passage. Baffins Milton Rovers maintained their unbeaten start in the Wessex premier division with a 2-2 home draw against Hamble Club. 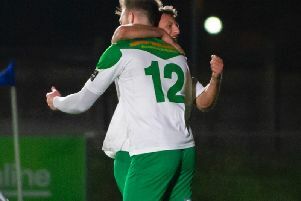 The home side led twice with a goal from Joel Jackson and a penalty from Shane Cornish but the visitors forced the draw with a goal five minutes from time.